It's time for another monthly roundup of Wendy's Favorite Things, and this month's Great Eight features some really great products. 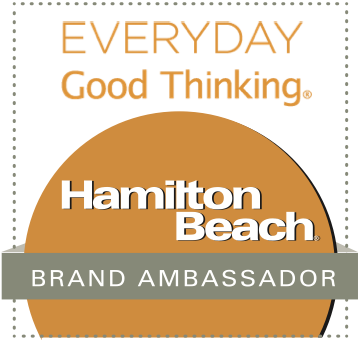 Just wait until you see what I'm sharing this month to help you make it through the dog days of Summer! (1) Honeysuckle Gelato. Honeysuckle Gelato is based in Atlanta, Georgia. Their gelato is ultra-creamy and so flavorful. I don't live in Atlanta to visit one of their store locations -- but I'm very fortunate that I can buy it here in Texas! I love all of their fun, creative flavors! My personal favorites are the Sea Salted Caramel and the Peppermint Bark -- it's like Christmas in July when you crack open a pint! 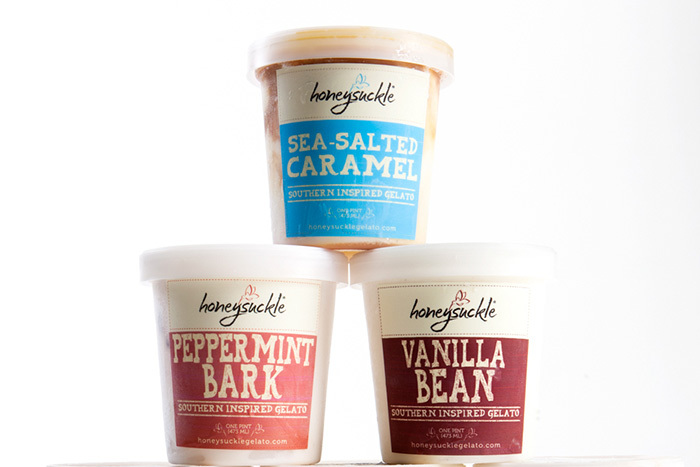 Honeysuckle Gelato is available at select retailers in the Southeastern U.S. My Texas readers can find Honeysuckle's delicious gelato in the freezer section of all Central Market locations. (2) Plated. 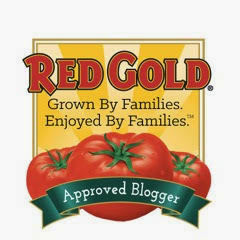 Love to cook, but don't have time to grocery shop because of your busy life? Enter Plated! This fantastic mail-order food service lets you select from a variety of chef-created menus in several categories each week: Beef, Poultry, Seafood, Vegetarian, and Dessert. 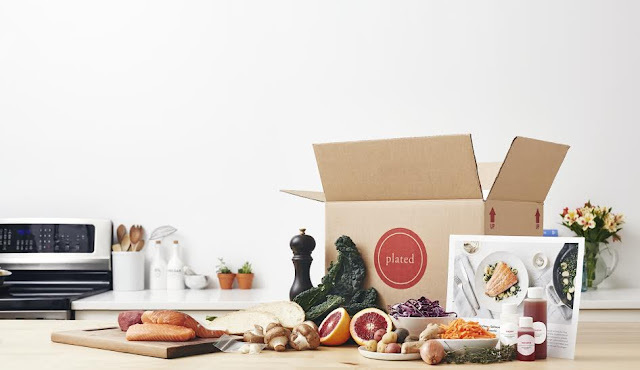 Simply select a daily menu that grabs your eye, and a box with all the pre-portioned ingredients to make that meal will arrive at your front door within days. 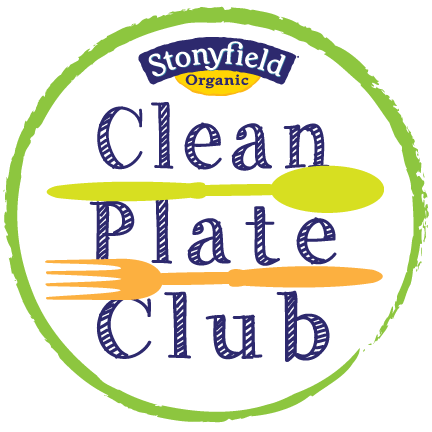 Plated is so convenient, and they use only the best-quality ingredients! I especially loved how simple it was to create a gourmet Gruyere and Ricotta White Pizza with Asparagus and Balsamic Vinaigrette at home using Plated -- on a busy weeknight, no less! To try Plated for yourself, check out the delicious menus for August. Then, sign up and order the menus that appeal to you most. (3) Pacari Premium Organic Chocolate. When I attended the Food & Wine Conference earlier this month, one of our sponsors was Pacari Premium Organic Chocolate. One bite was all it took to decide it's some of the best chocolate I've tasted in ages! 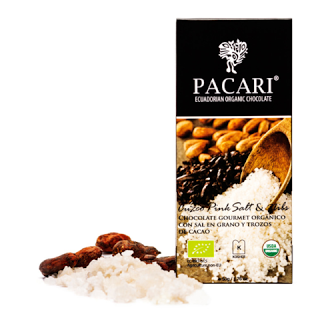 Pacari is a line of premium organic chocolate, and it's the first single-origin organic chocolate made entirely in Ecuador. Pacari carefully selects the best ingredients and works in small batches to create their chocolate. My favorite flavors were the Pink Salt & Nibs and the Andean Mint. All ingredients used to make Pacari products are 100% organic and produced using fair and equitable standards. Every item is crafted to maintain the complex flavor profile of the Arriba Nacional cacao bean. Pacari partners with small cacao growers in Ecuador to preserve their traditional way of farming, which safeguards the biodiversity of Ecuador's cacao. Pacari offers sustainability programs that benefit the cacao-growing communities they work with. Pacari can be ordered online or purchased at select retailers. (4) Ruffino Prosecco al Fresco Flutes by govino. Italian winery Ruffino has partnered with govino to create a gorgeous set of limited-edition flutes decorated with a vibrant Summer design that's the very meaning of effortless Summer fun. No matter where you go, a colorful flute of crisp Ruffino prosecco is the perfect complement to warm, sun-soaked days that define Summer. The flutes’ yellow and orange colors and unique floral pattern add notes of elegance and style to a glass that is both versatile and durable, making it the ideal companion for the perfect Summer wine: Ruffino prosecco! The flutes are available for just $20 per 4 flutes. If you haven’t tried Italian sparkling prosecco, Summer’s the perfect time to give it a try. Refreshing Ruffino prosecco is fruity and fragrant with notes of citrus, pears, and apples. It also has subtle hints of hawthorn, wisteria, and elder. Ruffino prosecco pairs well with pizza, fish, shellfish, and chicken dishes -- making it ideal for Summer entertaining! To find Ruffino prosecco near you, visit their online store locator. (5) McConnell’s Fine Ice Cream. McConnell’s premium ice cream is based in Santa Barbara, California, and they offer a line of creatively flavored premium ice creams. Their ice cream is rich and ultra creamy – with a definite California accent when it comes to fun flavors. Every flavor we sampled was delicious, but we had two favorites: Michael loved the tart Eureka Lemon & Marionberries, and I was crazy for the addictive sweet-salty Sea Salt Cream and Cookies. 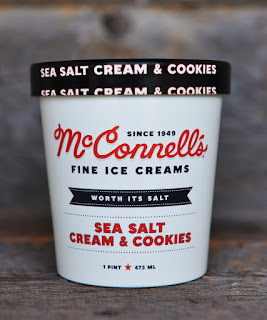 Lucky for us, pints of McConnell's ice cream can be ordered online for shipment across the U.S. – it arrives perfectly frozen, even at the height of the Summer heat here in Texas! 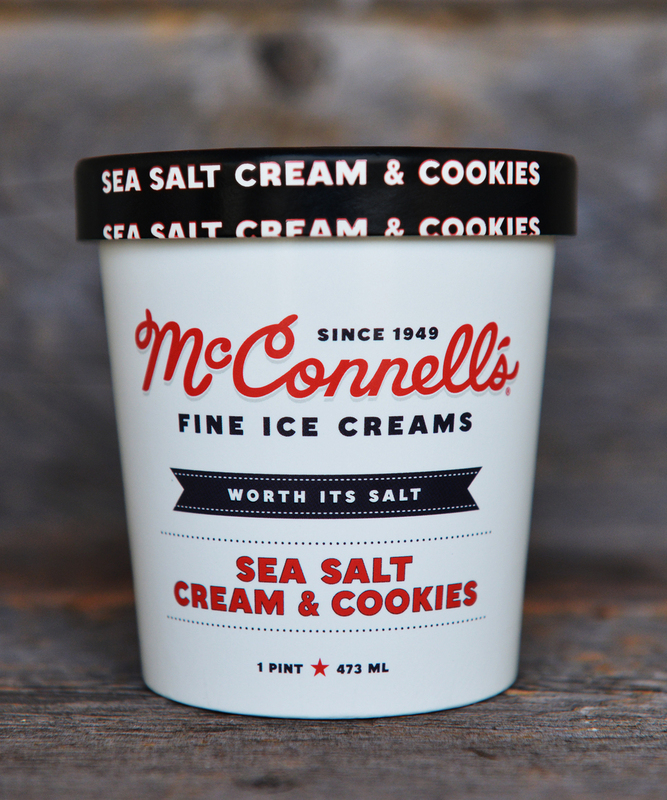 McConnell’s ice cream is also sold at select retailers across the country. (6) Cedar's Snack Packs. I’m always looking for healthy portable snacks and lunch components to take to work. 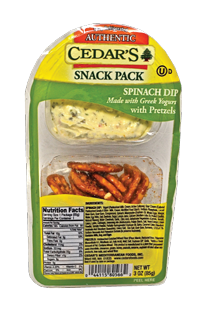 I recently tried a variety of Cedar's Snack Packs, which contain single servings of crunchy dippers and Cedar's delicious dips and hommus. 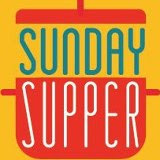 The line includes Classic Original and Red Pepper Hommus with Pretzels, Tzatziki with Pretzels, and my personal favorite flavor combo: pretzels with creamy Spinach Dip. The spinach dip is made with Greek yogurt, so it’s creamy, but lower in fat. This snack pack has 200 calories and just 10 grams of fat. It's perfectly portioned and so yummy! I add a piece of fruit and some 2% cheese cubes for a quick lunch I can enjoy at my desk on busy days. Cedar's products can be ordered online, and they're also at many major grocers. (7) American Flatbread. American Flatbread's delicious wood-fired flatbread pizzas are made in New England. They come in lots of great flavors to appeal to both vegetarians and meat eaters alike -- they even offer gluten-free flavors too! American Flatbread pizzas cook up perfectly crisp on your oven rack. In the time it takes for the flatbread to bake, you have just enough time to pour some wine and toss together a simple green salad. I've tried two flavors, and both were excellent. The Fresh Basil Pesto & Feta is veg-friendly and made with fresh basil, toasted pine nuts, olive oil, minced garlic, and a generous amount of feta. I added a quick Greek salad for a quick weeknight dinner. The Sliced Tomato & 5 Cheese features fresh mozzarella, smoked cheddar, sage, and asiago cheeses. It cooked. 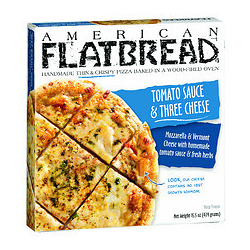 American Flatbread can be ordered online, and you can find it at most large grocery chains. (8) Sheila G's Brownie Brittle. One of my favorite chocolate snacks is Sheila G's Brownie Brittle. If you love the crunchy end pieces of a pan of brownies, these are the perfect treat for you! 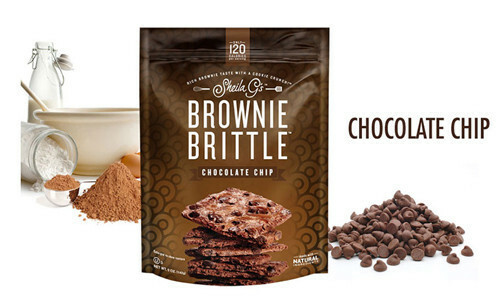 Brownie Brittle is crispy and bursting with chocolate flavor. My favorite flavor is the Chocolate Chip. Each bite is thin and crispy, with a burst of chocolate from the chips baked inside. Each 1-ounce serving is just 120 calories and 4 grams of fat -- not bad for a chocolate treat! I love to eat the brownie brittle straight from the bag, but I also love to crumble them and sprinkle on Greek yogurt or ice cream. Sheila G's is currently offering free shipping on orders more than $49 from their online store -- no promo code is needed! It's the perfect opportunity to try the other yummy flavors in the line: Mint Chocolate Chip, Toffee Crunch, and Salted Caramel. For die-hard chocoholics, OMG-size 1-pound packages of Sheila G's Chocolate Chip Brownie Brittle can be purchased at COSTCO and Sam's Club locations. Disclosure: The manufacturers of the products featured in this article provided me with sample items to facilitate inclusion. All opinions expressed are solely my own, and I only feature items that I have personally tried and enjoyed.